an experiment that confirmed that atoms have a magnetic moment, the projection of which on the direction of an applied magnetic field takes on only specific values, that is, is quantized with respect to direction in space. The experiment was performed in 1922 by the German physicists O. Stern and W. Gerlach. They investigated the passage of a beam of Ag atoms (and, later, beams of atoms of other elements) in a highly inhomogeneous magnetic field (see Figure 1) in order to verify the theoretically obtained equation for the space quantization of the projection μ2 of the magnetic moment μ0 of an atom on the Z direction. The equation is μ,z = μ0m, where m = 0, ± 1, . . . .
A force F = μz ∂H/∂Z acts on an atom having a magnetic moment and moving in a magnetic field H that is inhomogeneous in the direction longitudinal to Z. The force deflects the atom from its original direction of motion. If the projection of the magnetic moment of an atom could vary continuously, a broad diffuse band would be observed on the photographic plate P. However, in the Stern-Gerlach experiment, the atomic beam was found to be split into two components that were symmetrically shifted by a quantity A with respect to the original direction of propagation; that is, two narrow bands appeared on the plate. The results of the experiment indicated that the projection μ,z of an atom’s magnetic moment on the direction of the field H takes on only two values, ± μ0, that differ in sign. In other words, μ0 is oriented in the direction parallel to H and in the opposite direction. The value of the magnetic moment μ0 that was measured in the experiment from the shift Δ turned out to be equal to the Bohr magneton. The Stern-Gerlach experiment played a major role in the further development of concepts of the electron. According to the Bohr-Sommerfeld theory, the orbital angular momentum and, consequently, the magnetic moment of the atoms used in the experiment, which have a single electron in the outer shell, should be equal to zero. Therefore, such atoms should not, in general, be deflected by a magnetic field. The Stern-Gerlach experiment showed that, contrary to the theory, the atoms used have a magnetic moment. In 1925, the Stern-Gerlach experiment, together with previous experiments, led G. E. Uhlenbeck and S. Goud-smit to the hypothesis that the electron has intrinsic angular momentum, which is called spin. Shpol’skii, E. V. Atomnaia fizika, 4th ed., vol. 2. Moscow, 1974. Their topics include interpretation and misinterpretations of quantum theory, principles of empiricism and the interpretation of quantum mechanics, fluid dynamic representation and quantum jumps, quantum-to-classical transitions through weak measurements and post-selection, and a top-down versus a bottom-up hidden-variables description of the Stern-Gerlach experiment. 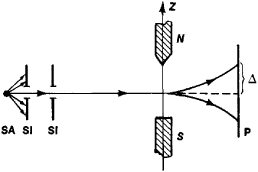 One critical experiment is a four-stage sequential Stern-Gerlach experiment measuring the x-, then the y-, then the x-, then the y-components of the spin of a particle.